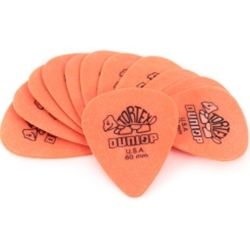 Get Some Good Sounds from Dunlop's Tortex Picks! 12 Standard .60MM Guitar Picks..
Tortex picks are carefully designed and manufactured to give the characteristic maximum memory and minimum wear that made the original tortoiseshell famous. Dunlop's Tortex guitar picks are available in a variety of shapes and gauges.